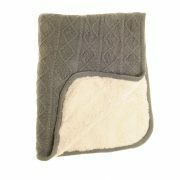 2 layered blanket: a thick sherpa fleece underlayer and cable knitted blanket top layer. A really warm blanket for little ones. 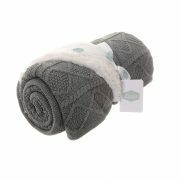 Stylish cable knit design in a rich grey colour with cream fleece underneath. A perfect gift. A stylish cable knit design in a rich grey colour with cream fleece underneath.